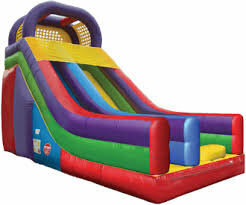 Check out this colorful 18' slide its a great slide for back yard parties or events. This slide is great for the little ones all the way up to adults. Climb the ladder and slip down the slide. The wacky slide will keep the kids busy all day long.